Simply put, toddlers aren’t just miniature adults. Their nutritional needs are different because they are going through an intense period of mental and physical development. Coupled with that, is the fact that their digestive and immune systems are immature and they simply are not able to tolerate many of the foods that adults ordinarily consume. The proliferation of childhood obesity, asthma, food allergies and Attention Deficit Hyperactivity Disorder (ADHD) has focused attention on the role of diet and nutrition in healthy growth and development. Itís very tempting to give toddlers food they shouldn’t have. When confronted with toddlers sitting in their high chairs, begging for some of the salty crisps everyone else is scarfing down, most people find it hard to resist. But many foods particularly processed and junk foods can be harmful for young children. Adult foods are often far too high in salt and sugar for toddlers. Young children should consume less than two grams of salt a day, about a third of the amount recommended for adults. Also, avoid giving your toddler sugary treats. Opt for natural sugars in fresh fruit, rather than candy or foods with added sugar. High intake of refined sugar has been linked to hyperactivity and behavioural problems in children and contributes to a wide range of other health issues. Toddlers need to be fed food that is easy to digest. As a general rule, food should always be cooked, particularly vegetables, as raw foods are more difficult to digest. Serving food at body temperature also aids in digestion. There are plenty of ideal baby foods available and with free baby samples readily available online you can try a bit of everything and see what your child prefers. Avoid giving toddlers chilled or frozen foods. To ensure that your child doesnít have sensitivities to certain foods, follow the four day rule; wait four days after introducing a new food before adding another. It can sometimes take a two or three days for an allergic reaction to become apparent. With stomachs at least five times smaller than an adult, toddlers need to eat small amounts of nutrient and energy rich foods frequently throughout the day. Some nutritionists recommend as many as five small balanced meals a day interspersed with nutritious snacks. Unlike adults, young children need a high fat, low fibre diet. Itís recommended that until about age four, at least thirty percent of their diet is made up of fats. Of course, most of those fats should be healthy unsaturated fats derived from vegetable or fish sources. Insufficient fat in the diet can stunt growth and cause developmental delays. 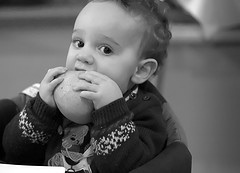 Too much fibre in the diet, on the other hand, tends fill the child up and they wonít be hungry enough to get all the nutrients they need to thrive. Many of the foods that adults eat can pose a serious choking hazard for toddlers and should be avoided until the child is older. Treats like popcorn, whole nuts, raisins, marshmallows, hard or jellied candy, and chewing gum can slip down the throat and block the childís windpipe. Jamie Anderson is an extremely happy and lively parent with two little children named Amelia and Freddie. Jamie also enjoys shooting family portrait photography and writing about anything parenting related. In any spare few minutes he has, he blogs about bargains and helping other parents with great deails and free baby stuff offers. Children, babies, and toddlers DO need saturated fats. I’m sorry but you’re just wrong. Our kids also take their Belly Boost chewable probiotic to help them with digestion and absorption of all the good vitamins from our whole foods diets! We try to eat mostly whole foods anyway and our kids love it!